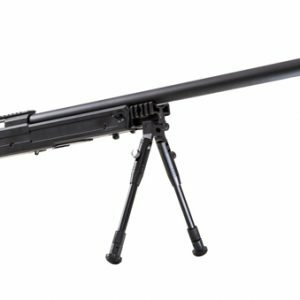 This sniper rifle is made on the basis of an airsoft body from «G&G». Construction materials are impact-resistant plastic and light alloy with steel elements. This body was so reliable and high quality that we managed to maintain the functionality of all control elements which is uncommon for taggers that are made from airsoft bodies. The switching mechanism for this M14 laser tag sniper gun is a vandal-proof lock located at the bottom of the foregrip. The charging socket is located near. The power source is a lithium battery with 3 Ah. It provides up to 30 hours of playing laser tag without recharging. The speaker is located in a metal magazine. We haven’t drilled additional holes for retaining the identity. And without that, the sound is quite loud. Recharging is made with the bolt; the gun safety lock located on the trigger guard kept its native function. The rifle has an adjustable telescopic stock, that changes the rifle length from 36.5 to 42.5 inches. The weight of this gaming kit is 8.8 lb. Four tactical rails allow a player to install various additional devices: scope, bipod, etc. Sniper optical system provides an opportunity to hit targets at a distance up to 820 feet. The use of a hybrid optical module will increase this parameter up to 1300+ feet. This M14 laser tag sniper game kit has raised the ante of a quality of taggers made from airsoft bodies to a new level. Unfortunately, these airsoft bodies are classified as rare, so these taggers are made only after an order.